Cooling Tower Repairs & Service: SPX/Marley Cooling Towers | RBE Inc. Climate control is crucial for any building, and depending on the region you’re operating in, regulating your building’s climate can be tricky. Efficient cooling towers are no exception. There are many systems working together and sometimes a small malfunction can greatly impair or shut down an entire system. At RBE, we provide comprehensive diagnostics and fast repairs that can get your system up and running efficiently again. We provide in-depth inspections, regular maintenance services, and if needed, complete reconstruction of commercial cooling towers, to ensure your operations are not without climate control for very long. Even with proper, regular maintenance, over time, cooling tower parts suffer the effects of wear and tear. If your cooling tower is more than 10 years old or has been neglected, it’s probably showing signs of wear and tear, starting with insufficient bearing lubrication, loose pulleys and fan hubs, or fan shafts that are scored and worn. This type of mechanical damage can significantly impact the functionality of the fans and could result in much greater system wide damage. The combination of air, water, chemicals, and heat running through your cooling system creates a corrosive environment for the cooling tower. Although galvanized metal is used in areas of high exposure to help prevent the effects of internal corrosion, it’s common to find perforations, holes, and metal wastage in these sheet metals. Without proper treatment, this can lead to premature corrosion, threatening the safety and proficiency of the entire cooling process. Pipelines connect the cooling towers to other HVAC components. When external and internal corrosion develops, the entire system is in jeopardy. Early warning signs include reduced efficiency or functionality. When not treated, corrosion will eventually deteriorate the connections between pipes and cooling towers and cause leaks. This is especially true for hot and humid areas. 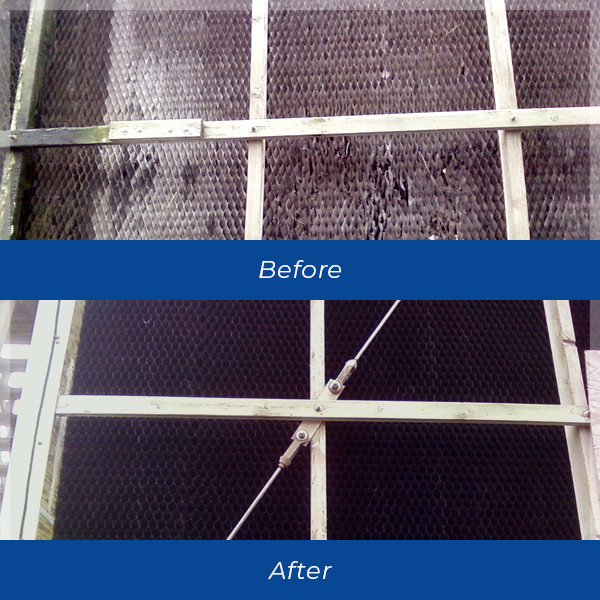 To operate efficiently year-after-year, your cooling tower needs professional maintenance. RBE maintains cooling towers and industrial HVAC systems across SE Michigan. Your water quality should be checked every two weeks. Regular checks prevent buildups of minerals and sludge in your system. When a motor fails, your cooling tower fails. To maintain your motor, we monitor current and voltages, keep bearings lubricated, and note any unnecessary vibration. A broken fan leads to breakdowns in other parts of the system. We keep your fan running efficiently by inspecting then cleaning blades, monitor the fan’s alignment and balance, check drive couplings and belts, and lubricate bearings. How Will My Cooling Tower Repair Be Handled? Our #1 goal is to get your system up and running as quickly as possible. At RBE, we have the technology to quickly troubleshoot the issue, assess the damage, and determine the best solution for returning your system to operational status. We stock a full line of industrial cooling tower parts and our experienced techs can make most repairs in the same visit. All work is guaranteed! Concerned about your cooling tower? Give our team a call today at (248) 874-2006 for personalized repairs and maintenance.